SlideShare Revisited – Slidecasting, LeadShare and AdShare, Oh My! YouTube for presentations. That’s how I’ve most often explained SlideShare to people when asked about the site. However, some new business-focused enhancements make it a much more useful marketing tool, IMHO. For those of us in the corporate world that seems to live and die by PowerPoint, SlideShare presents a great opportunity to make those decks our organization is so good a producing available to a wide audience for viewing and sharing. And, according to an article today in eMarketer, Americans want brands that inform them. I opened my SlideShare account two years ago when I was being asked to speak about bringing Dell into the virtual world of Second Life. Around that same time I opened an account for Dell that is now managed by the Corporate Communications team. What led me to revisit what you can do with SlideShare was a combination of hearing talk about their new SlideShare Business services and my own snide remark on Twitter about someone else’s presentation on SlideShare. I then filed in my mind an idea for a post here about what not to do with presentations on SlideShare and expected to use that presentation as my prime example. I intended to point out how presentations that might make sense when you were speaking to them needed to be edited for an audience that can’t hear you before you post them to SlideShare. Well … it’s a good thing I usually think longer about and do more research for my blog posts than I do my microblog tweets. The first time I looked at it, I had not noticed the little yellow triangle in the top left corner of the presentation that told me it was a Slidecast. Slidecasting, it turns out, is a new multimedia option on SlideShare for viewing slide decks synchronized with an audio file. It allows you to take slides and audio and link them together using SlideShare’s free, web based interface. You currently have to find your own host for the audio file, but SlideShare says they may host those in the future, too. While the visuals remained a bit boring, listening to someone narrate the slides made them much more impactful than silent viewing had done. There’s a lot of potential here, I think, to reach your online audiences! Wouldn’t be surprised, too, if the audio hosting might be SlideShare’s next line of revenue. You only pay for LeadShare if you collect a lead, and you only pay for AdShare if you get a click. And the cost of those payments is more than reasonable for small and medium businesses – much less large enterprises used to paying much more for lead generation. Measuring the ROI on social media is a much-discussed challenge (see: Mashable, The BrandBuilder Blog, eMarketer and of course, a presentation on SlideShare, or two) and SlideShare Business looks to make it that much easier. Sure, a long-term relationship with your audience should still be the ultimate goal, but having metrics like this makes it that much easier for you to justify your social media investment. Is it pure chance that President Obama and I are both in New Orleans on this Blog Action Day? Well, yes. But, on a day dedicated to blogging about climate change, its gives me reason to focus on my home state. The coastline of Louisiana and New Orleans itself are excellent examples of the effects climate change is having on us. Scientists say New Orleans and the barrier islands to the south will be severely affected by climate change due to rising sea levels and a growing intensity of hurricanes. It has been reported that between 10,000 and 13,500 square kilometers of coastal lands will drown due to rising sea levels and subsidence by 2100, a far greater loss than previous estimates. Rather than focus on the gloom and doom predictions, however, I thought today I would highlight a group that is doing something to not only rebuild what climate change has already damaged, but to also prevent additional environmental impact and improve people’s lives in the process. Founded in 1994 by activist and philanthropist Diane Meyer Simon, Global Green is the American Arm of Green Cross International (GCI), which was created by President Mikhail S. Gorbachev to foster a global value shift toward a sustainable and secure future by reconnecting humanity with the environment. Following Hurricane Katrina, Global Green set up an office in New Orleans where they now work to rebuild the city in a greener way. Global Green is working to address some of the greatest challenges facing humanity. In the United States our their work is primarily focused on stemming global climate change by creating green buildings and cities. The Global Green Holy Cross Project is of vital importance to Global Green, the Holy Cross Neighborhood and the people of New Orleans. Success will show others that sustainable affordable housing is possible and will create a model that can be replicated by communities around the world. 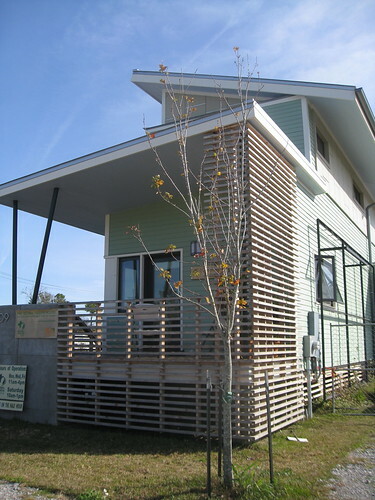 By utilizing multiple green and healthy building strategies, the Global Green Holy Cross Project seeks to reduce long-term operating costs from energy and water bills, create a healthier living environment by eliminating toxic materials, protect the environment through the use of sustainable materials and empower the people of the Lower 9th Ward to work toward a healthy and sustainable future. While many may debate the rebuilding of New Orleans at all, saying we are just “stubbornly clinging to the notion that we are the masters of our environment,” I fall into the camp of those who love the city and want to see it rise again. Global Green seems to be going about that in the right way, so I applaud their work and thank them for it here today. I guess enough people know about it around the office that I can go ahead and let the rest of the world know – I’m moving into a new job! That’s not to brag that everything was perfect (you might have heard about our last earnings announcement). Or that there weren’t still things to be done in my role setting strategy and managing the corporate “About Dell” content on Dell.com. I’m passing many ideas not yet implemented on to the person comes behind me, and there are probably many more that she will see. That’s really why a move appealed to me – I don’t want to get in a rut of doing the same thing, the same way. I’ve always done my best work when pushed beyond my comfort zone, and some “fresh blood” will be good in my current role. So, where am I going? Well, not too far it turns out. I’m moving on to another position at Dell in Small and Medium Business Marcom as part of the Global Digital Capabilities team. The official title is MarCom Senior Consultant, and my first order of business will be the optimization of several global landing pages. But, the truth is without sales there would be no business to communicate about. While some still say PR is more interested in relationships, I have to believe that social media and the impact it is having on how companies interact with people online is causing marketing to place more value on relationships, too. So, I’m excited for the opportunity to bring all of my background in business communication and social media to this new role and to make an impact on how Dell markets our products and services to small and medium business customers. I’ll be transitioning jobs (read: doing two at once) through the month of October and will be working to immerse myself in the SMB world. If you work in a small or medium-size business, be prepared for me to pick your brain!